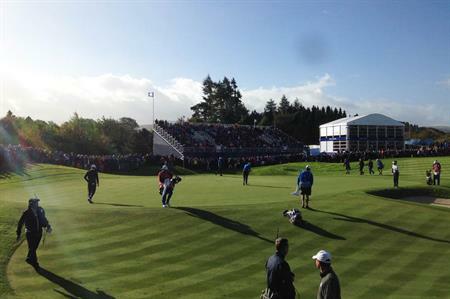 C&IT caught up with Stuart Smith, director of events and leisure at Gleneagles, to discuss the Ryder Cup, which took place last weekend (26-28 September). How long has the Gleneagles 2014 Ryder Cup been in the making? We won the event in 2001, so 13 years. It's been a long journey to get here, involving lots of discussion with the Ryder Cup Europe team. About three or four years ago we started to make changes. The hotel has been consistently refurbished since then, including the recent £250,000 transformation of our main event space the Gleneagles Suite. How has the day-to-day running of the hotel changed? For the last couple of years we have been working on the main event operation. From an event perspective, it has actually been pretty straightforward. Gleneagles has a great deal of experience [in hosting large events], for example the G8 summit took place here in 2005. The main changes are security-related – we have to think about how staff come in and out of work, and that the right people have access to the right areas. It hasn't really affected staff numbers, more how we allocate staff. It's all about planning, so the main personnel change was bringing in an infrastructure manager and there has been a small amount of extra media training for existing staff. During the event, on-course hospitality is operated by Compass and Mecco so that isn't under our remit. Who stays at the hotel during the event? Ryder Cup Europe takes over Gleneagles for a week – Monday to Monday – so responsibility sits with them. In residence were the two sets of players and their caddies; the captains and vice-captains; European and USA team officials; sponsors; and VIPs. Are the venue's event spaces being used? Every function space at the hotel is being used, for a variety of purposes, including as team rooms, office space, physio rooms and so on. It's a jigsaw puzzle. The equestrian centre was used as a reception venue for 1,500 guests. What will the legacy be for Gleneagles from hosting the Ryder Cup? It goes back to the reason we pushed for the event. We're a standalone hotel and it's essential to help raise our status and put us on the global map to attract more events and corporate business in the future. Already we are planning to improve our offer on the back of the Ryder Cup, with significant developments to the estate beginning in 2015. Finally, what has hosting the Ryder Cup meant to Gleneagles? We're representing Scotland and the UK in terms of hospitality. The Ryder Cup is beamed into 600 million homes worldwide, making it the third most watched sporting event ever. So it's about putting us and Scotland on the map and we'll look back on this event with a huge sense of pride.